Note---Before cooking anything, it's recommended to have all the ingredients cut, measured and ready to go. Then when cooking the items, work as quickly as possible so items aren't overcooked. Have whatever you are serving with the finished dish ready, so you can literally serve the shrimp in the pan, steaming hot and just off the stove! 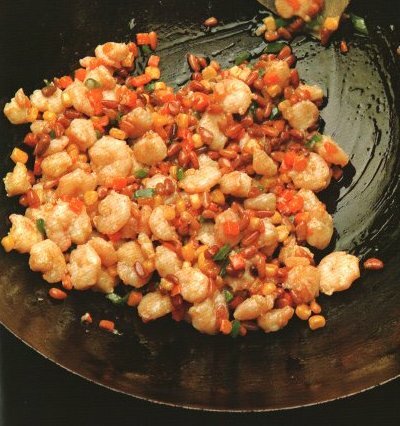 "An Authentic Chinese Restaurant Recipe"
Marinate the prawns in the egg white, salt, white pepper, cornstarch and rice wine for 20 minutes. Dice the carrot and cut the scallions into 1/4 lengths and set aside. Add 2 tbsp. oil to the shrimp and mix well then add them to the saved, very hot oil, stir-fry for about 30 seconds in then lift out of the pan to a plate. Quickly discard the oil and wipe out the pan. Stir-fry the carrots, scallions and ginger for 30 seconds in 2 tablespoons very oil, add the corn and stir-fry for another 30 seconds. Add the cooked prawns, pine nuts, soy and sugar and cook mixing well for 1 minute on high heat. Serve with white rice or on crisp and cold iceberg lettuce leaves cut as to look like a small bowl. Additional flavoring of Hoisin Sauce, thinned with dark sesame oil, soy and water to the consistency of heavy cream is very popular with this type of dish and can be found in most markets.